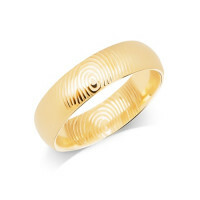 Fingerprints are available on the outside and inside of your ring. Either drop us an email at info@howweddingrings.co.uk with the order number and your fingerprint image or follow our instructions to get a clear fingerprint and we will do the rest to give you a beautiful unique ring. You will need an ink pad and a clean piece of plain white paper. Place your finger onto the ink pad and then onto the white paper. You should now have a clear fingerprint on the paper. Repeat steps 1-3 (above) if your partner is ordering one too. Then post the two separate pieces of paper to us with a copy of your wedding ring order. 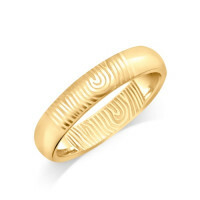 It’s important you tell us which fingerprint you want on which ring, and you must tell us whether you want the fingerprint on the inside or outside of the ring. If you have any queries on the above process, please do not hesitate to phone or email us. 9ct White Gold Gents 6mm Fingerprint Wedding Ring..
9ct White Gold Ladies 4mm Fingerprint Wedding Ring..